Spring and summer 2019 program info! Being a safe and confident bicycle rider isn’t just about wearing a helmet. Helmets are a crucial “last line of defense” but wearing a helmet is passive (it doesn’t make a motorist less likely to hit you). We believe it’s equally important that children understand road safety, basic traffic law, and defensive bike handling so that they can travel and share the roads with knowledge and confidence. We’re committed to providing safe and fun opportunities for riders of all ages and abilities to practice, advance their skills, ride with friends and learn to navigate their communities. In addition to the program offerings below, we are happy to create a custom event or program for your school, scout troop, organization, neighborhood, etc. We even do Bike Birthday Parties! 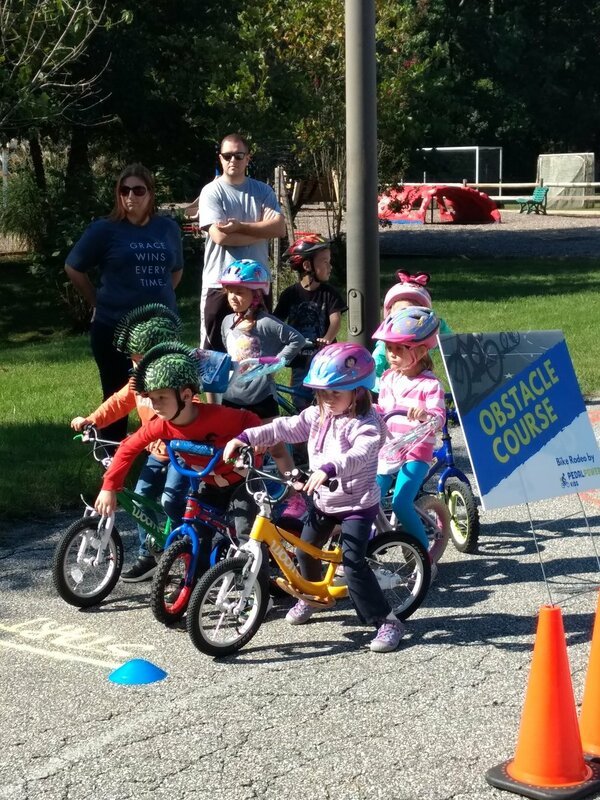 As certified League Cycling Instructors, we have the professional training, resources and materials to plan and execute a variety of bike safety-related events for groups of children and adults. Scheduled on-demand online, our signature Learn to Ride lessons for up to 3 children are results-guaranteed. In a very short time, your child will be riding confidently and safely. For families looking for a weekly group class option, we offer our signature Learn to Ride service in a small group setting. We partner with local Recreation & Parks departments to offer group classes in convenient locations. For Spring 2019, we will offer Group Learn to Ride Classes on Thursdays at Pip Moyer Recreation Center in Annapolis at 5 & 6:10 pm (1 spot remaining) MORE INFO AND REGISTER HERE, or Tuesdays at Kinder Farm Park at 4:15 (FULL). All classes begin the week of April 22nd, run for 6 weeks and are for ages 4.5-11. If you need a bike to use for class, we have bikes available. OR gather your group, and we’ll come to you, on your schedule. It’s just as economical and much more flexible to gather 2-3 friends and schedule semi-private lessons online - we have availability 7 days a week. Some children certainly benefit from the positive pressure of a small group of peers all working towards the same goal! Our Bike Clubs are for developing riders who are ready to improve their skills and endurance through group rides in and around local trails and parks. Often, there is ice cream involved! Typically meeting weekly, we have weekday and weekend options- just shoot us a note to learn more! You asked, we delivered- Bike Club was created because many of our students just wanted to keep riding with us! Bike Club members are typically ages 5-12 and must be able to ride proficiently without training wheels. Spring Bike Club @ Kinder Farm Park begins April 23rd, Tuesday nights from 5:10-6:30 pm. REGISTER HERE. We also run a drop-in Weekend Bike Club that meets in various locations in the area. This group is best for intermediate riders. Contact us if you are interested in being added to the group! SUMMER 2019 CAMP SCHEDULE AND REGISTRATION IS HERE! Our Learn to Ride summer camps offer a fun and encouraging environment to ditch the training wheels and ride with confidence! Many campers begin the week reluctant, scared and resistant- and often by the end of the second day of camp, all campers are riding independently! There’s something to be said about the positive peer pressure of a group setting. In addition to learning to ride independently using our signature “glide” method, campers learn to turn, start & stop, modulate speed, ride in a group and much more. In partnership with Anne Arundel County Recreation and Parks, camps are offered at county parks and include a variety of fun elements on and off the bike- from crafts to games to learning about healthy food choices and visiting with local seniors. The week ends with a decorated bike parade for parents and friends, and a new batch of lifelong riders! My grandson is finishing up his week at bike camp and he has had an awesome time. He’s much more confident riding, he’s learned the rules of the road and so much more at this 🚲 camp. Many of our Learn to Ride campers return to PedalPower Kids for our Adventure Camps. Making use of area parks and rail trails, these half day programs introduce campers to longer touring rides and improve bike handling and group riding skills. There’s always a few ice cream and snowball rides as well! By week’s end, campers are riding up to 15 miles. To be the first to know about upcoming programs and camps and register early (we sold out last year! ), sign up here to receive our newsletters. A Bike Rodeo is an awesome way to teach bike handling and safety skills to a large group of children of all ages. We can work with schools, scouts, churches, parents’ groups and more to design an engaging, educational and fun event for your organization. We bring all of the equipment, set up the stations and course, and will provide organizational tools/sign up sheets for planning. You provide the parking lot and the riders! Recent Bike Rodeo events include City of Annapolis Bike Day, Annapolis Mothers of Multiples Bike Rodeo & Learn to Ride, Lifeline100 Kids Bike Rodeo and Chesapeake Montessori School Spring Fair. Contact us for more information. PedalPower Kids can deliver powerful education content for bicycle safety at your school in a format that meets your time needs and goals. From PE Class presentations to after-school programs, we are prepared to engage your students with critical safety information to enhance existing bike to school students and encourage and inspire new ones. We also offer After-school Programs for developing riders, similar to our Bike Clubs, where we do weekly fun rides that incorporate skill development and navigation.